I’ll be cooking and eating out lots, so watch this space for a flurry of posts on my return. I leave you with some pictures which, for obvious reasons, didn’t make the grade on earlier posts. I love mashed potatoes, and I love garlic. Put the two together, and you’ve got the perfect starch to accompany a roast chicken, a steak or – pish! – whatever protein you fancy. The garlic mash you’ll find in some restaurants is a bit questionable. Some places skimp, and use powdered garlic, which is a total disaster, leaving the dish tasting musty and somehow unpleasantly acidic. Try making it this way at home for a much mellower, smoother taste. Put the peeled potatoes and the peeled garlic in a thick-based saucepan, and cover with water. Bring the water to the boil and simmer for 15 minutes. Drain, and return the potatoes and garlic to the pan. Mash the potatoes and garlic with the butter while you bring the milk to a simmer in a separate pan. Use a wooden spoon to beat the milk into the mashed potatoes, and then stir the finely chopped parsley through the dish with the seasoning. Serve immediately. Ladurée is one of my favourite Parisian tea-rooms. They’ve recently opened a branch in Harrods in London, their first outside France. It’s a jewel of a place, with little linked salons in the style of Napoleon III, serving excellent teas, faultlessly French light meals and some of the best patisserie you’ll find in London. These people have style coming out of their ears; Ladurée is the pastry consultant for Sophia Coppola’s film about Marie Antoinette. My Mum and I were at Harrods for a day of Ladies’ Nice Things, and stopped off for tea and macaroons at Ladurée. Ladurée’s macaroons are what makes them so very famous: crisp discs of ground almonds with a soft middle, sandwiched together with flavoured cream. The macaroons are served festooned with raspberries, pistachio cream and other good things if you have some in the tea-rooms. I bought a large box to take home as well. These macaroons are flavoured delicately with the highest quality ingredients. There’s a basic range which is available all year round, and some seasonal flavours. (The black one in this box was a seasonal one; liquorice, which was surprisingly subtle and tenderly flavoured.) The flavours aren’t what you’d expect – the pale pink one here is scented with rose petals, the gold one caramel with fleur de sel (sandwiched together with some of the creamiest, most delicious caramel I’ve ever eaten). At certain times of year an orange flower macaroon is available, and I had a violet and cassis one in Paris a few years ago which I still think about fondly on occasion. Eating at the tea-rooms themselves is a lesson in luxury. 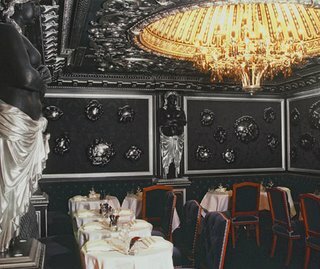 Each salon is decorated in a different style; this is the Black Salon, a tiny room packed to the gills with Etruscan caryatids. Zeus, surrounded by snakes, glowers from the middle of the cupola in the ceiling. I am informed that the velvet on the seats is made from pure mohair, and I can’t think of anywhere nicer to enjoy your truffle and morel omelette. If you visit Ladurée, ask for the violet-scented black tea. I brought a (very expensive) packet home, and it’s glorious stuff; delicately scented and laced with violet and hibiscus flowers. 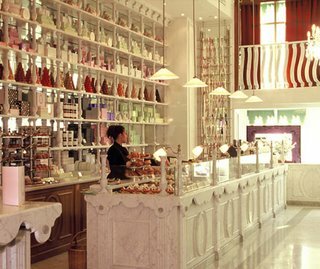 I’m going to have to make another visit in a month or so – I have a dreadful craving for a black truffle religieuse and a large box of marrons glacés. If you’re craving something crisp, packed with flavour and full of fresh herbs and zingy spice flavours, nothing else will do: you need Thai fishcakes. This recipe uses creamed coconut, which gives you a really velvety texture inside the fishcake, along with a powder-crisp surface. Peel the lemongrass, galangal and garlic and put them in the food processor with the lime leaves, zest, chilli, coriander, red pepper and creamed coconut. Whizz until everything is finely chopped. Add the fish and seasoning, and pulse until the fish is incorporated but not sloppy. Remove the mixture to a bowl, and form into little fishcakes with a diameter the length of your thumb. (See picture for thickness.) 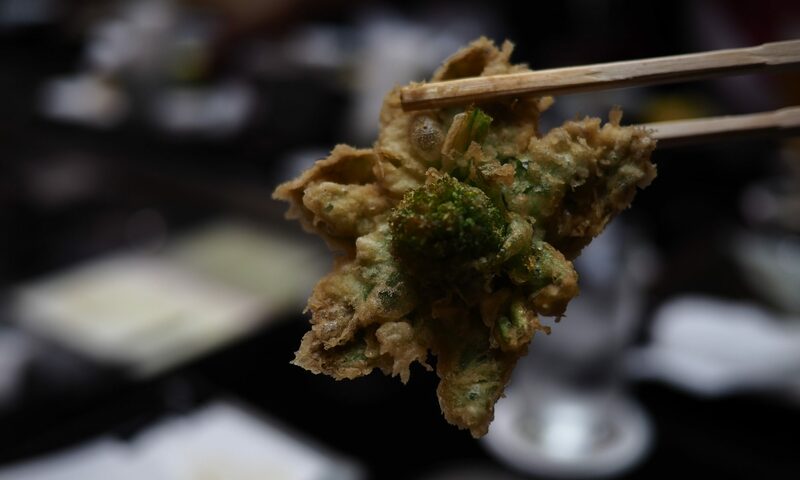 Dip each Thai fishcake into plain flour and fry in hot oil for about four minutes per side, until golden brown. You should fry these in batches of about six to avoid crowding your pan – keep cooked fishcakes in a cool oven until they are all ready. I served these with some blended lime juice and fish sauce, and some Thai sweet chilli sauce. The apples are falling off my trees as fast as I can core, peel, slice and bag them for freezing. At this time of year, when you’ve apples galore, try recipes like this which are extremely generous with the fruit; a cake crammed with them will be darkly moist and juicy. Freshly ground black pepper and a tiny pinch of cayenne lift the cinnamon in this cake and somehow make the apples taste all the more applesome. I’ve made a cream cheese icing for no other reason that that it’s my favourite. If you want to try something different, try a buttercream icing with two teaspoons of ground cinnamon worked through it instead. Place all the cake ingredients except the apples in a large bowl, and mix thoroughly using a hand blender or a wooden spoon and elbow grease. When the ingredients are well blended, add the apple chunks to the bowl and combine with the other ingredients. Pour everything into a greased springform tin, and bake at 180° C for an hour. After an hour, test with a skewer (if the skewer comes out sticky, the cake is not finished). When the cake is cooked, set aside to cool. Blend the cream cheese and icing sugar and spread over the surface of the cake when it has cooled. This cake is especially nice in the afternoon with a big cup of tea. There are two ways to get the best out of a chunk of lamb – you can roast it fast and hot to preserve all the fragrance (see Frangelita’s take on it, which sounds fantastic), or you can cook it slowly at a low, low temperature for maximum tenderness and flavour. Frangelita’s honey/soy mixture got me thinking in the direction of teriyaki, and the shoulder of lamb in the freezer suddenly started to look a lot like serendipity. This lamb is cooked for six hours, so the fat melts into the flesh. The fibres in the muscle will be coming apart so the meat is falling off the bone; you should be able to carve it with a blunt spoon. The skin becomes crisp, and the teriyaki sauce and juces from the onion permeate the moist, tender flesh until it’s perfectly delicious. I served the lamb with rice, and some spaghetti squash tossed in parsley and butter. If you’re using spaghetti squash, just prick it a few times with a fork, pop it in the oven an hour before serving at the same temperature as the lamb, and remove the seeds when it comes out of the oven. Fluff some butter, salt and fresh parsley through with a fork before serving. Lay the onions on a non-stick baking dish with their cut sides facing skywards. Rub the garlic and ginger over the lamb, and place the joint in the tray, surrounded by the onions. Drizzle the teriyaki sauce over the lamb’s skin and dip the cut sides of the onions into any that leaks onto the bottom of the dish. Place the baking dish into the oven. Check every 45 minutes that the liquid isn’t boiling dry – if it looks as if it may be, add a few tablespoons of water. Use the liquid to baste the onions and the lamb. After six hours the onions will be caramelised and gooey. The lamb will be incredibly moist and tender, with a crisp crust. Rest for ten minutes before pulling the meat apart with two forks, and serve with rice to dribble the onion-y juices over. I first came across this recipe on the Two Fat Ladies’ television show a decade or so ago. Their version of a shooter’s sandwich was very plain – just a steak, salt, pepper and two Portobello mushrooms inside a hollow loaf of bread. My recipe for this perfect picnic food is a bit more exciting, with more steak, more mushrooms, plenty of garlic, fresh herbs, some sauteed wild mushrooms and a generous spiking of vermouth. It’s delicious, and it looks so fantastic when you slice into it that your fellow picnickers will be speechless first with awe and later because it’s very hard to talk through a mouthful of mushrooms and meat. Cover the dried mushrooms (I used a mixture of porcini, shitake and oyster mushrooms) with boiling water and set aside. Slice one end off the loaf and hollow out the middle, setting the soft crumb to one side. Saute the steaks, seasoned with pepper but without salt, for two minutes per side in the olive oil. Remove to a plate. It is important that your steaks are rare so that they give up their moisture to the sandwich when pressed. Reduce the heat and melt one knob of butter in the pan with the olive oil from the steaks. Saute the Portobello mushrooms with two smashed cloves of garlic until the mushrooms are soft and starting to release their juices. Transfer to the plate with the steaks. Melt the other knob of butter in the same pan, and drain the dried mushrooms, reserving their liquid. Saute the dried mushrooms with two more smashed cloves of garlic for about five minutes, then add half the soaking liquid and the vermouth. Simmer until all this liquid is reduced to a few tablespoons of glossy syrup. Season the steaks and mushrooms with plenty of salt and some more pepper. Build layers of steak, Portobello mushrooms, wild mushrooms and herbs inside the loaf until you have used everything up – if any cracks appear in the loaf, patch with the crumb you reserved. Pour any juices from the plate into the sandwich with the liquid from the pan. Wipe the cut end of the loaf in any remaining pan juices and put it back on the loaf. Wrap the whole thing in three layers of greaseproof paper and tie up tightly with string. Place the loaf on a chopping board so the steaks are lying horizontally. Place another chopping board on top of the loaf and weight it down – I used two large, cast-iron pans and both sets of weights from the scales. Leave the sandwich (no need to refrigerate) for five hours. Serve the sandwich by simply slicing through the whole stuffed loaf with a breadknife. The steaks will be juicy, the pressed mushrooms silky, and the whole thing full of concentrated flavour. If it’s too late in the year for picnics, don’t worry; just serve with some hot sauteed potatoes for a filling supper. Make a martini with some more of the vermouth if you feel that way inclined, and enjoy.